My first exposure to the work of Mizuki Shigeru was indirect, in the form of Miike Takashi’s wonderful 2005 film Yôkai daisensô (eng. The Great Yôkai War), which I saw last year. Amongst the most impressive aspects of that thoroughly enjoyable movie was the often iconically simple and inventive character designs given to the host of yôkai appearing throughout. Yôkai is the common term for the multitude of spirits and demons of Japanese folklore and author and mangaka Mizuki is probably their most significant ambassador to the world of 20th-century popular culture. Mizuki being such a strong, simple stylist whose stories are celebrated widely in Japan, it was only natural that Miike would be drawing on his ideas and designs for his delirious yôkai epic. Now, however, Mizuki’s own work has at long last come to the west, and to great critical acclaim. His autobiographical masterwork NonNonBâ to Ore, in French just plain NonNonBâ, was recently recognised by perhaps the finest distinction a comic can be granted in the West – the Angoulême book of the year. And let it be said immediately: Mizuki, though far from epic in scope, does not let down the promise provided by Miike. A veteran of World War II, Mizuki (b. 1922) debuted as mangaka in 1957. He is best known for the series Ge Ge Ge no Kitaro (French publication of which will be undertaken by Cornélius later this year), was the teacher and mentor of such luminaries as Tsuge Yoshiharu, Tatsumi Yoshihiro, and Ikegami Ryôichi. He has received significant honours for his work from both the Japanese comics industry and the government and has had a road and museum named after him in his hometown of Sakaiminato, Tottori prefecture. In other words, this is one of the heavyweights of Japanese auteur comics, and by all accounts one of its most original voices. The cuteness factor of Mizuki’s characters – wide-open benign eyes, up-turned snout-like mouths, and thoroughly round heads – is considerable, and initially a little off-putting in what are obviously serious stories. However, much like the manic characterization of Nazakawa Keiji’s Hiroshima memoir Hadashi no Gen (aka. Barefoot Gen), this does not take long to get accustomed to and is ultimately a way of achieving subtlety through clarification. The wide-open faces of the characters invite us in, and leave us receptive to the particulars of their interaction. The visual relation between his cartoony characters and the richly textured backgrounds, probably drawn by an assistant, is not always as seamless as it could be, but is still fundamental to the realistic tone of his stories. NonNonBâ is a relatively recent work (it was first collected in 1992), and judging from what little I know of Mizuki’s oeuvre,* it seems to me to represent a kind of artistic culmination of themes he has been working with throughout his career. Narrating his childhood in a small coastal town during the 30s, it charts the physical as well human growth of the young Mizuki, named Murata (his original name), primarily through his relationship with an old wise woman, the NonNonBâ (“Grandma”) of the title, who communicates with the spirits, as well as his friendships with two young girls who both disappear from his life under circumstances that by all accounts are tragic, but in Mizuki’s hands play out as subdued delineations of his coming to terms with life as it is, anchored in allegorical sequences of succinct beauty. Mizuki’s voice is soft-spoken, preferring allusion to explication, and it is on the strength of his subtle, suggestive storytelling that NonNonBâ soars. NonNonBâ’s life in abject poverty and how she survives on the charity of the other villagers, who “hire” her to carry out assorted tasks around their houses and the like, is never explicitly described, but made evident through the interaction between her and the other characters. Especially the often mundane-sounding dialogue provides proxy for the issues at hand. The respect Murata, his brothers and mother pay to his father, who evidently spends most of his time hustling in Osaka, every time he is home, and the way they support his impractical idea of running a cinema in the village may say a lot about the patriarchal family structure of pre-war Japanese society, but also evokes the love they all have for him, and their appreciation of his presence as a human centre of the family between the panels. 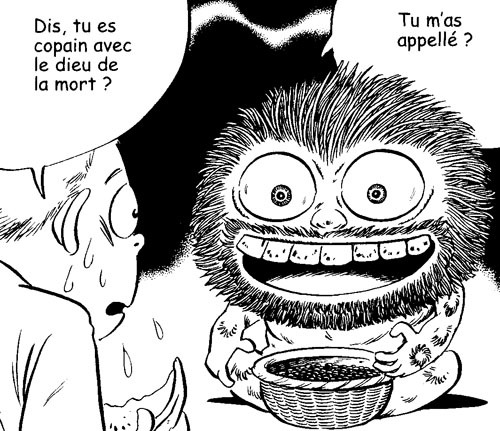 In a way very similar to David B’s recreation of his childhood in L’Ascension du haut mal, Mizuki describes his process of growth as one lived in communication with the supernatural, with the important difference that the nature of the spirits surrounding Murata is much more ambiguous than that of David B’s masterpiece. In the most masterful single feat of persuasion in the book, he strikes an impeccable balance between allegory and genuine presence in what is otherwise an acutely realistic world. The yôkai “exist without existing” as Murata’s most direct liaison with their world, the frank-speaking, grinning Azuki-Harari tells him at one point. Different spirits interact with the characters and mark the key events narrated in the story by their presence. This is especially the case in connection to Mizuki’s personal experience, the reader’s understanding of which is enhanced by their presence. Azuki-Harari for example acts as Murata’s maturing sense of conscience by providing a running transcendental perspective upon the hardships he faces through the story. To the reader accustomed to external realism being reflected in the characterization of the internal lives of the character’s, NonNonBâ‘s protagonist is slightly alienating. Far from being the confessional narrative so common to most Western autobiographical comics, this story positions its protagonist as a kind of exemplary cipher at the centre of events. Despite Azuki-Harari’s admonishments, Murata never seems to make a false move, or to harbour less than decent, selfless thoughts. He is thoroughly immune to the petty and brutal machinations of the bands of street kids around him, who of course reflect the war-like atmosphere of Japan in the 30s, accepting their ostracism without much anguish when it comes, constantly keeping the upper hand while drawing his comics and tending to the needy around him. Contrary to, for example, Tsuge Yoshiharu’s similarly autobiographically derived stories, which tend to center around deeply conflicted, inert characters, Mizuki’s autobiographical narrative is an ideal projection. Muraki is an exemplar; he seems to be the child Mizuki wishes he had been, and wishes we would all be. * The only other work I have read is the only other one available in French, 3, Rue de mystères, which collects a number of short stories from the 70s (Cornélius does not provide a date of original publication – a pet peeve of mine). This is a wonderful book in its own right, offering sundry ghost and horror stories all at their core dealing with death and coming to terms with it – evidently a central preoccupation of Mizuki’s, and, as mentioned, magisterially treated in NonNonBâ. Shigeru Mizuki, NonNonBâ, Paris: Cornélius, 2006, 420 pages color/black and white, €29; 3, Rue des mystères, Paris: Cornélius, 2006, 238 pages, black and white, €14. For more info, visit Cornélius’ crappy flash site here and Mizuki’s homepage (in Japanese) here and check Xavier Guilbert’s review of NonNonBâ here. 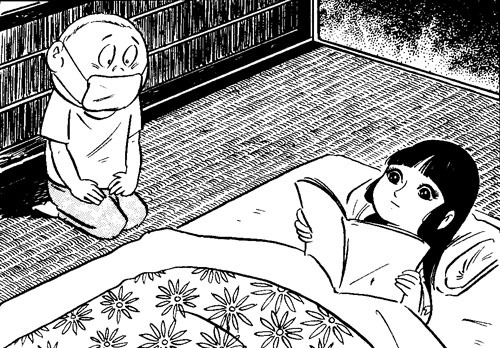 The pictures, both extracted from NonNonBâ and – alas – lettered in comic sans, show Muraki talking to Azuka-Hariri and watching his friend Chigusa reading on of his comics.